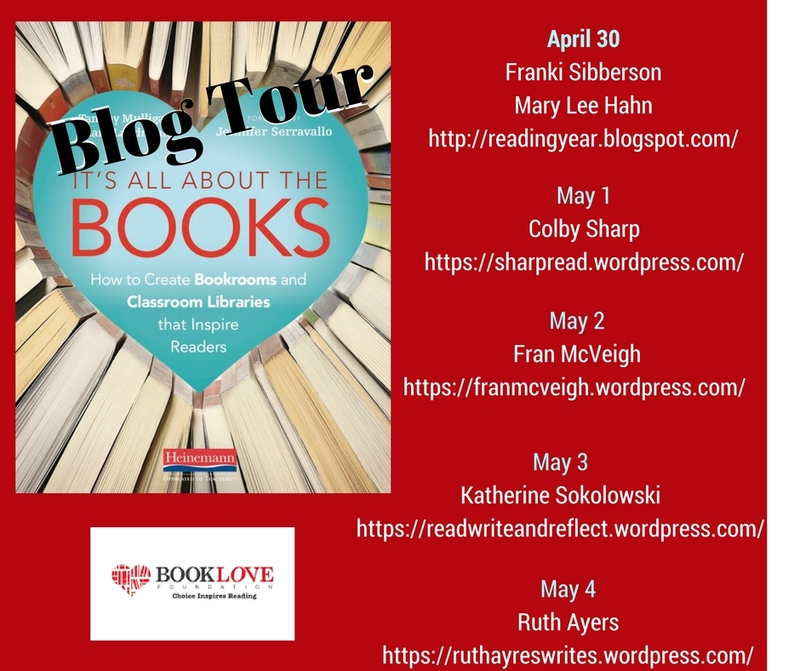 We are so happy to be the first stop on the It's All About the Books book tour! We are so excited about this book. We have always been fans of Tammy and Clare's work --loved their book Assessment in Perspective and were part of their tour then! We love this new book and are excited about the impact it will have in schools across the country. Make sure to stop at all the other stops on the blog tour this week! Franki and Mary Lee: How has your thinking evolved about classroom libraries over the years? Clare and Tammy: Initially, we set up our classroom library before the students arrived at school. All of our books were organized in plastic bins and we knew exactly where each and every book was located. Our library remained the same all year except for one book display that rotated each month. Now we include students in the process of setting up and maintaining our classroom library. Instead of getting everything set up before they arrive, we provide the baskets, labels, and markers and let the kids set up the library. When the students set up the library, they know where the books are and feel more invested in the space. As they decide how to organize the books, we listen in to learn more about their interests and passions. The more students are part of the process, the more we learn about them as readers and the better we can help them find books they love. The classroom library is now more than a place to pick books. When we design it with our readers, and when we are set up to flexibly meet their changing needs and preferences, the classroom library truly becomes the home of an active reading community. Franki and Mary Lee: What advice do you have for teachers about keeping up with good books to add to their classroom libraries? Clare and Tammy: We keep up with good books by relying on our PLNs, both locally and globally. We connect with our local PLNs by visiting book stores and public libraries to check out what is new. We also speak with the school librarians, teachers, and reading coaches at our partnership schools to hear about what they are reading and what their students are enjoying. Franki and Mary Lee: How do you think classroom libraries should evolve over the course of a single school year? Clare and Tammy: Readers love new books! Classroom libraries should be refreshed and revised to meet the ever-evolving needs of our students. A classroom library should reflect the growth and curricular journey of the students throughout the year. When the class studies particular authors, genres, and topics, we add these texts to the library. As students share their personal interests and preferences we can also add these texts to our library. We are purposeful in introducing new series and authors to add complexity to the library as our students’ reading skills develop. Throughout the year, we try to look at our library through the eyes of our students. We ask, “Does the library offer a range of choices that will engage and support all the readers in the class?" We take this information and use it to revise and refresh the classroom library. 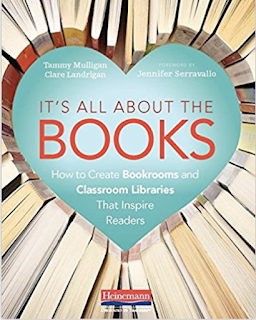 Franki and Mary Lee: How has your thinking about bookrooms evolved over the years? Clare and Tammy: We used to think about bookrooms as a place to store shared leveled texts for small group instruction (i.e. six-packs.) As we observed bookroom after bookroom not being used by teachers, we decided to revise our thinking. Now we design bookrooms as an annex to every classroom library – we design each with the other in mind. Teachers need books to support all aspects of reading and writing instruction, not just books for small group instruction. As we talked with teachers, we heard again and again that they did not have the volume or range of texts they needed for their students to read independently. It is near impossible for a classroom teacher to source a library that is equipped to meet the needs of each student year after year. We shifted our thinking and decided the largest section of the bookroom needs to support independent reading. These texts are organized by bands of text complexity into baskets of approximately 20 single titles that are categorized by genre, author, series, and topics of interest. This design makes it easy for teachers to grab a few baskets and add them right to their classroom library. The bookroom also has baskets of read aloud suggestions organized by grade level, mentor texts for units of study in writing workshop, texts to support content area curriculum, and even baskets of paired texts to support partner reading. We still have some texts organized in 6-packs for small group instruction and book clubs, but this is now only one section of the bookroom. Ideally, bookrooms supply the depth, breadth, and volume of books to supplement what each teacher needs and every student wants. All of this organized in grab-and-go baskets for a teacher to simply (and quickly) take and incorporate into her classroom library. Franki and Mary Lee: For teachers who have very few books provided by their schools/districts, where do you suggest they start? Clare and Tammy: This is a tough question because we believe that books are an essential tool for teachers. When schools provide desks and chairs for students, they should also allocate funds to ensure that every classroom has a vibrant and engaging classroom library. In the first chapter of the book, we cite research to support teachers in advocating for what they need to inspire lifelong readers. If you don’t have books to source a classroom library, we recommend you get in touch with your school librarian and begin by borrowing books from the school and public libraries. You can borrow collections of texts organized by author, genre, series and topic to figure out what your students love. Once you have a sense of what engages your students, ask the school librarian to help you gather some of these texts. Some teachers even ask parents to help out by going to their local branch of the public library to pick up books they need for the classroom library. Colleagues are another great option for borrowing books. Many teachers have a wealth of books and are happy to loan books, especially texts their students are not accessing at that time of the year. Even colleagues with a small collection may be willing to rotate books between classrooms to increase their volume of books as well. At some point, teachers do need to get some books of their own. Scholastic book orders are a great option for teachers to earn bonus points to purchase books. Box Tops is another way to earn money for books and families are happy to help out by organizing a collection. Families are also often willing to donate gently used books to supply classroom libraries. Grants are another source of funding. Many schools offer grants through the parent organization or local school foundation. Teachers also seek grants through Donors Choose and The Book Love Foundation (see question 6) to fund a classroom library. If you do receive funds be sure to check out specials with vendors, discount book stores and even public library book sales to get the best bang for your buck! We have many resources in our book, including lists of our favorite vendors and some of our tried and true texts, to support you once you are ready to go shopping! Franki and Mary Lee: Can you tell us why you chose to donate all royalties from this book to Book Love. Of all the literacy organizations out there, why this one? 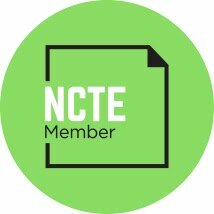 Clare and Tammy: When we decided to write a book advocating for more books in classrooms, we felt we had to help get more books into the hands of students and teachers. I didn’t feel right to highlight the problem without trying to be a part of the solution. We were trying to figure out how we could make an impact. Then we heard Penny Kittle speak at the Donald Graves Breakfast at NCTE. She shared how Don impacted her personally and professionally, “That generosity for someone he didn’t know just became a theme in my life.” We looked at each other in that moment and knew what we needed to do. We found Penny at the end of the session and asked her if we could join her mission for Book Love. Book Love is a not-for-profit organization founded by Penny Kittle with one goal: to put books in the hands of teenagers. We were fortunate that Penny and Heinemann both supported our vision and helped us bring it to life by generously agreeing to allow the royalties of our book to expand that goal and put books into the hands of elementary and middle grade students as well. Each time someone purchases a copy of It’s All About the Books, the royalties go directly to the Book Love Foundation to fund elementary and middle grade libraries. This made the project so meaningful for us – a book about books that will bring books into the hands of readers – what could be better than that! If you would like to donate directly to the Book Love Foundation simply send a check or donate online http://booklovefoundation.org/donate. If you would like your donation to fund elementary and middle grade libraries, please send an email to booklovefoundation@gmail.com or write elementary or middle grade libraries in the memo line of your check. Checks can be mailed to Book Love Foundation, PO Box 2575, North Conway, NH 03860-2575.
frost on our scarves from our breaths. puffing in the cold air. Blew us completely away. *Mr. Wald, our classroom stool-repairer, provided the memory that became this poem. Poetry Friday is one of the most beloved routines in our classroom. My students start the year not knowing the names of any children's poets and end the year with favorite poets and favorite books. (I'm pretty sure someone has hidden I'm Just No Good At Rhyming so they won't have to share it!) One of my greatest hopes is that they will be able to hold onto this love of poetry! 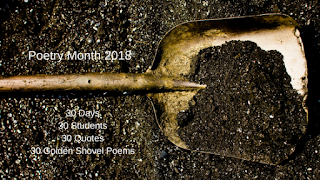 Irene has the Poetry Friday Roundup this week at Live Your Poem. say? The snow has quit? The sun is shining…or at least trying?!? Making a Valentine box is like making a life. (your life or your Valentine box) amazing! (collaboration makes us all smarter) tree. 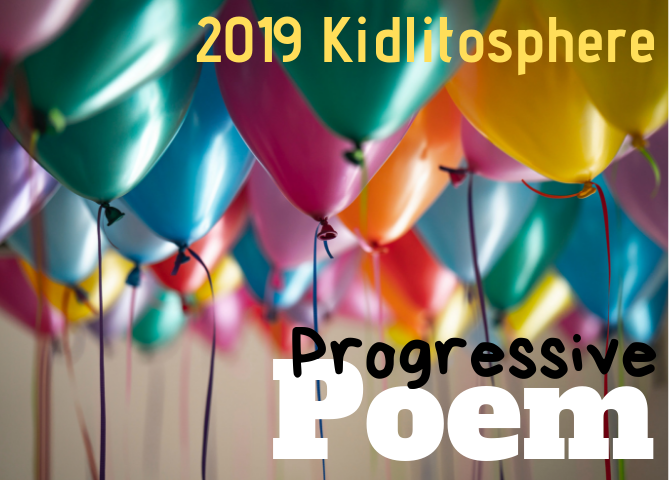 Welcome to the 24th line of the 2018 Kidlitosphere Progressive Poem! Thank you, Irene Latham, for this (now beloved) yearly tradition! In Heidi's "pre-progressive poem pre-poetry month poetry friday round-up" post she assigned us the task of jotting some thoughts after the first line went live and then hiding them from ourselves until it was time for our line. 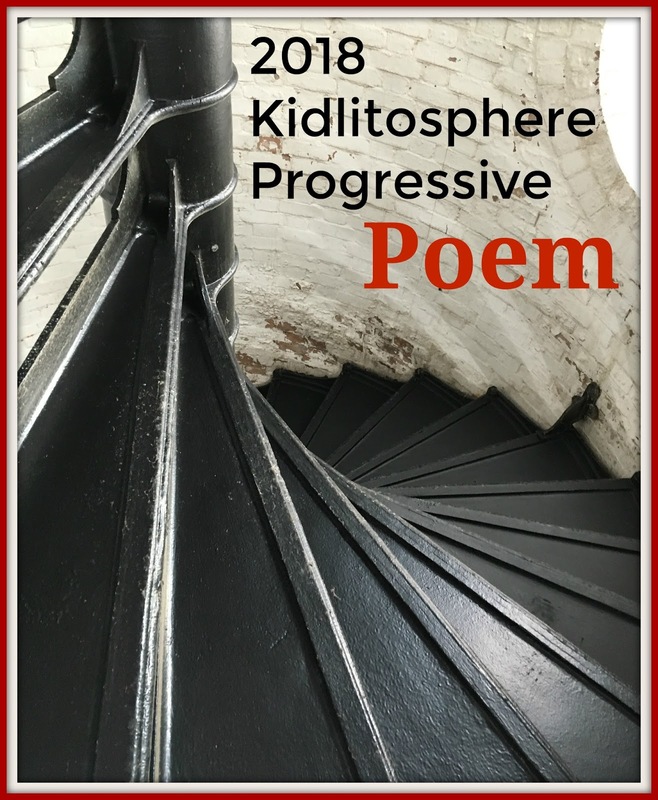 several poets have chosen to leave their lines open at the end. Cue several hours of brainstorming and doodling, hair-pulling and thesaurus-consulting.